UPDATE - MAY 14, 2018: To avoid any potential disruption with early voting, the State of the City address scheduled for tomorrow, May 15 at 6:30 PM, has been moved to 7:00 PM. We apologize for any inconvenience this may cause. The State of the City address will be followed by the City Council meeting which will include a reception for the transitioning City Council members. 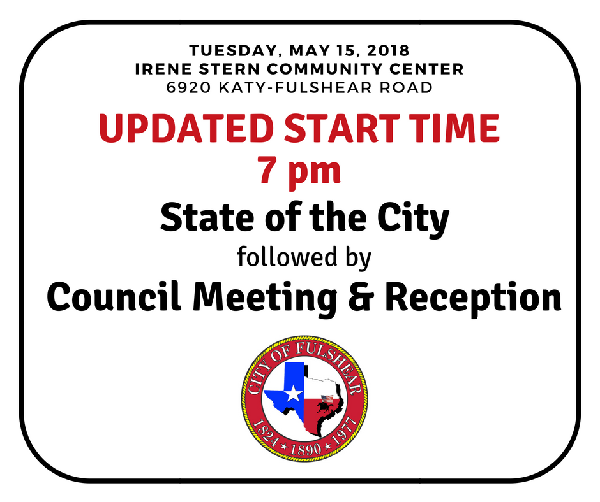 MAY 9, 2018: Fulshear Mayor, Jeff W. Roberts, will present the “State of the City of Fulshear” to the general public at 6:30 p.m.7:00 p.m. on Tuesday, May 15, 2018, at the Irene Stern Community Center. The address will provide a snapshot of the current state of Fulshear, as well as a brief look back at the last year of growth. Mayor Roberts will be joined by Jack Harper, Fulshear’s new City Manager, who will offer brief comments on what’s on the horizon for the City organization. The regular City Council meeting will be held immediately following the State of the City address, beginning at 7 p.m. This meeting will mark the transition for incoming and outgoing Council members, and the new City Council will be seated following the official canvassing of the May 5 General Election results. A public reception will be held during the meeting to thank the outgoing Mayor and Council members – Jeff Roberts, Tricia Krenek, Tommy Kuykendall, and Stephen Gill – for their service; and to welcome the new Mayor and Council members – Aaron Groff, Kent Pool, Joel M. Patterson, Debra Cates, and Lisa Kettler Martin – to their new roles. Please mark your calendars, and plan to join the City as we reflect on our past accomplishments and look enthusiastically towards Fulshear’s bright future!